The Volkswagen Passat is an easy one to mount accessories. Not such an easy car to drive. There is a small switch behind the steering wheel that puts the automatic transmission into a lower gear. I must mistakenly touch it every five miles. Every time I make a left turn. 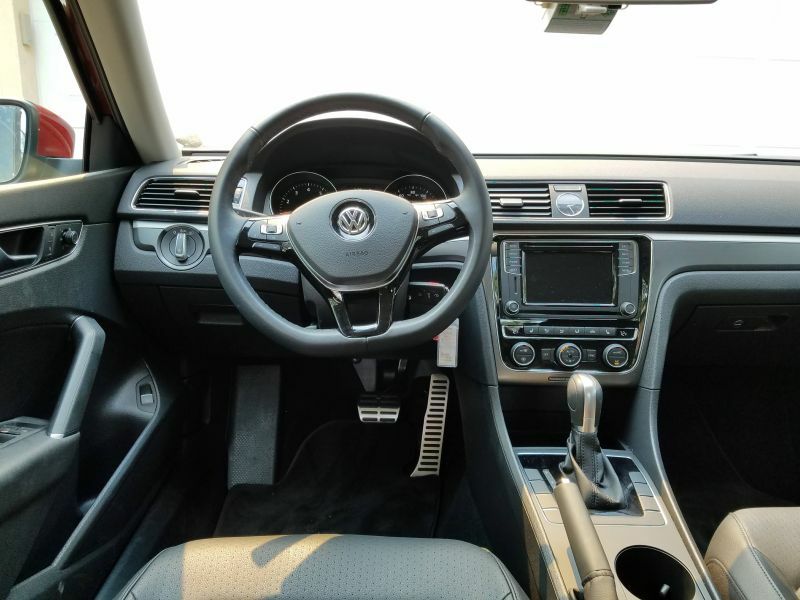 This isn’t a car review so let’s take a look at what mounts work well in a Volkswagen Passat. The executive summary is every location except the seat bolt will work well in a Volkswagen Passat. The seat bolt difficulty is one that we are seeing on a greater basis with later models. The bolt sits within a rail and the seat bolt claw won’t fit. Additionally, the bolt itself uses a Torx type of mechanism so it technically isn’t even a bolt any longer. More of a big screw. As we normally do, a photo of the interior is attached to this article. It’s a very conventional design. Not a lot of bazaar curves or lips. As already mentioned, this is an easy one. It rivals our all time champion, the Toyota Camry in terms of ease of mounting. The most popular location for mounting a cell phone or GPS continues to be the windshield so let’s start with those mounts. The Volkswagen Passat windshield isn’t overly sloped and can be easily reached by the driver. We’re beginning to see larger smartphones so we want a mount that can fit almost any phone. Consider the Arkon Slim Grip Ultra Travel Mount for the windshield. The cradle opens to over seven-inches which is easily large enough to hold almost any phone with or without a case. The cradle will also hold a small tablet but be sure not to block your view of the road. Remove the cradle and adapter from the above mount to hold a Garmin GPS. The ball is 17mm in diameter. It will snap right into the socket on the back of any cradle from a Garmin automotive GPS. If you just need the mount for a Garmin GPS, then consider the Arkon Windshield Dash Garmin Nuvi Suction Mount. Both of these come with a 2-year warranty. The Volkswagen Passat air vents are perfectly positioned for a mount. Use the vents between the passenger and driver. Nice and large with horizontal slats. One of our favorites continues to be the Square Jellyfish Jelly-Grip Car Air Vent Mount. The Square Jellyfish Jelly-Grip will hold a device up to 3 5/8 inches wide. A ball and socket allows the cradle to swivel in any direction. Like the previously discussed windshield mount, the cradle is removable to expose a 17mm ball suitable for a Garmin vehicular GPS such as a Garmin Nuvi or Garmin Drive. The cup holder is in a good place thanks to the upwards placement of the gear shift on the Volkswagen Passat. This is good for passive use in a car. Not good for using a GPS app as it isn’t in a good place for viewing while driving. Consider the iKross Cup Holder Mount for Tablets and Phones. These mounts include a cradle for a phone and one for the tablet. The mount is adjustable and solidly made. You will see a lot of mounts on the market for tablets or cell phones. This is the only car mount kit that I know of that offers two different cradles, one for the phone, the other for the tablet. You will not find a universal cradle that fits phones and large tablets with a single cradle. The tablet cradle will hold devices from 7 to 10.2 inches. Large enough almost all tablets except the largest ones such as the Apple iPad Pro. A CD player mount is going to work just fine in the Volswagen Passat. We are fans of the Mpow CD Slot Mount for SmartPhones which uses a knob on the bottom to secure it within the CD player. We prefer this mount to others in this category as it will permit a more custom and secure fitting. You don’t want the mount to rattle around inside the player. The cradle opens to 3.4 inches which is wide enough for most phones and many GPS devices. As a bonus, the mount has a 17mm ball so you can remove the cradle and just use it for a Garmin GPS. There you have it. This was an easy one. Everything except the seat bolt should work well on a Volkswagen Passat. Be sure not to block your view of the road and be sure everything is securely installed before use.